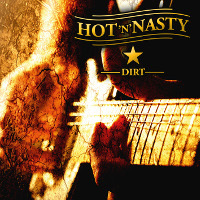 HOT 'N' NASTY have been on the scene for a while now and in there time have released a number of strong records winning them 2 awards in 2009 for "Best Rhythm & Blues album" and "Best Rhythm & Blues Band". So how does their 2018 effort "DIRT" fit in amongst the rest of their discography? This album has everything you'd expect from HOT 'N' NASTY; balls guitar playing, tight rhythm sections for that bluesy attack, infectious chrouses, gruff and powerful vocals… everything needed to make a southern rock album as great as it can be. And this time around I have to praise the production, this record seems to be mixed in a way that really fills the space, nothing feels too prominent nor absent, "DIRT" has a very warm production quality that really resonates with the music making it a very pleasurable listen! What I love about this record in particular is the variety of moods and styles of rock on display, I find that a lot of blues rock bands in the resent time tend to box themselves in to one particular sound throughout the majority of an albums running time, but with disc that is not the case; You have some real ballsy and hard hitting rock and roll chops on tracks such as the politically driven "Shake The Devil's Hand", the high paced "Real Thing" and infectiously groovy "Back On Track" which sounds like it has been ripped straight from ZZ TOP's repertoire and revitalized. Not to mention the slower straight up Blues tracks like "It's Only Money" and "Drifting" giving you an innate sense of walking through dusty roads the middle of nowhere. And my personal favourite song of the album being the ballad "Almost Like You're Here", a beautiful song starting with finger picked electric guitar in harmony with Robert Collins' soothing vocals patters, which slowly builds into a very angelic chorus, calling you to sing along and lose yourself in wonderful chord progressions, soulful guitar playing and heart gripping rhythm. All that wrapped in a package opening and closing with "Daylight"/"Daylight (Reprise), an encapsulating guitar piece as though pulled straight out of a Clint Eastwood western. This album is a glorious piece of work and has the potential to stand next to some of the biggest and best blues rock/southern rock albums. Buy this record!